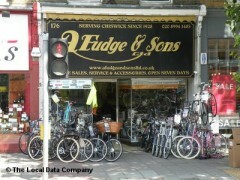 This has been 'my' bike shop ever since I moved to Hammersmith more than 15 years ago. I'm reviewing it now because I took the bike in to have a minor repair, expecting nothing more. But actually, the bike seemed transformed - light and smooth and fast. Reason is, the shop has a highly skilled and thoughtful mechanic who had seen what other little improvements were needed, and just done them. He's the same mechanic who was already working there when I first used the place. A big thank you to the guys in the A Fudge Cycle Store , Chiswick for the ladies’ hybrid I bought for my daily commute. I was a bit uncertain that the Liv Medium Alight was the right size and style for me, as I usually go for a man’s bike. But wow! I took it for a 20 mile run around Richmond Park and along the river. And the verdict? It’s fab. Really zippy on the flat, stable on the rough and it tackled the hills - including the challenging Broomfield Hill - with ease. Great sales advice from the salesman who took the time to explain the benefits of a woman’s specialist brand over a standard men’s bike without patronising, and allowed me to go for a test run. I am so happy with my purchase. Thanks again. Absolutely fantastic service, polite and helpful staff. Fast and efficient work done on my bike. Competitive Prices. Best cycle store in London IMO. Couldn't recommend more. They have really good service and the mechanics are have really good skills they know what they doing very helpful and friendly I was very satisfied from their service :) Definitely recommended!